A windmill takes energy from the wind (fluid) and produces power. The maximum theoretical power is 16/27 of the wind's power this is known as the "Betz limit". The winds energy, because it is moving, is in the form of kinetic energy and if all the energy was captured by the propeller or rotor there would not be an airflow consequently it can be said that the "lost" energy is used to keep the air flowing. It can be seen that by doubling the velocity of the wind the available power is increased eight times (2x2x2) and by doubling the blade diameter the available power is increased four times. When the power required is known and estimating the efficiency of the machine it is possible to size the rotor for the average wind speed available. Equally the efficiency that manufacturers claim can be calculated. It should be noted that when calculating the power available the efficiency of the total system should be used, that is, not only the generator and gearbox but also the transmission and storage. Wind turbines have "rated outputs" which give the best output at a particular wind speed. But this output must not be taken to mean power available i.e. rated output x hours, as the wind speed is not constant and will vary from around 1/10 to 1/3 of the figure. Efficiencies achieved in practice are much less than the theoretical 59.3%(16/27), that of a traditional windmill with a small number of sail-like blades is a little over 5%. However since wind is often available in practically unlimited quantities, this "efficiency" can become of little significance. http://www.alton-moore.net/wind_calculations.html online wind-turbine blade design calculator that accepts design parameters and outputs desired blade section at a user chosen number of points along the blade. Also provides a table of thrust, Watts, starting torque, power, RPM for a range of windspeeds. What he terms "Prop tip/speed ratio" (commonly 'tip speed ratio' or TSR) is the ratio of the velocity of the propellor tips relative to the wind speed. Higher ratios tend towards higher efficiency and more power per size. Very high ratios (say 10:1) result in brutal noisy machines which tend to tear themselves apart and whose blades are subject to substantial erosion from dust or even rain. These are the ones you can hear before you can see them. What may not be obvious is the effect on startup torque, which decreases with the square of the tip speed ratio. A very low TSR design will produce unspectacular RPM and probably lower efficiencies but MUCH more starting torque. If you want a machine that will turn lazily in the slightest breeze and produce at least a tiny amount of power in almost any conditions then low TSR is your friend. The more widely know cubed power increase with wind speed is readily seen. A prop which will produce 10 Watts in a 3 m/s breeze will produce 3 kiloWatt in a 20 m/s (40 mph) storm. Probably the biggest issue with wind power is that the wind does not blow consistantly or well at ground level. Wind must be captured at a height. Height involves cost and, more importantly, danger from both the tower and the blades. The lighter and lower the windmill can be, the better. http://www.greenwindmill.com Light weight, low cost, rotary power at the ground. Patent 5823749 But my tests show that this mill is LOUD. Each time the sails inflate, they pop. It sounds like a little gas engine at really low RPM. After one of my neighbors actually mentioned the noise from a rotating vent on top of my house, I realalized this wasn't going to cut it. FIGS. 1 and 2 are fragmentary views of the present invention that show the primary elements in their relative size and arrangement. FIG. 1 is a fragmentary, perspective view of the rotor with two of the four sails 10 in corresponding phases. 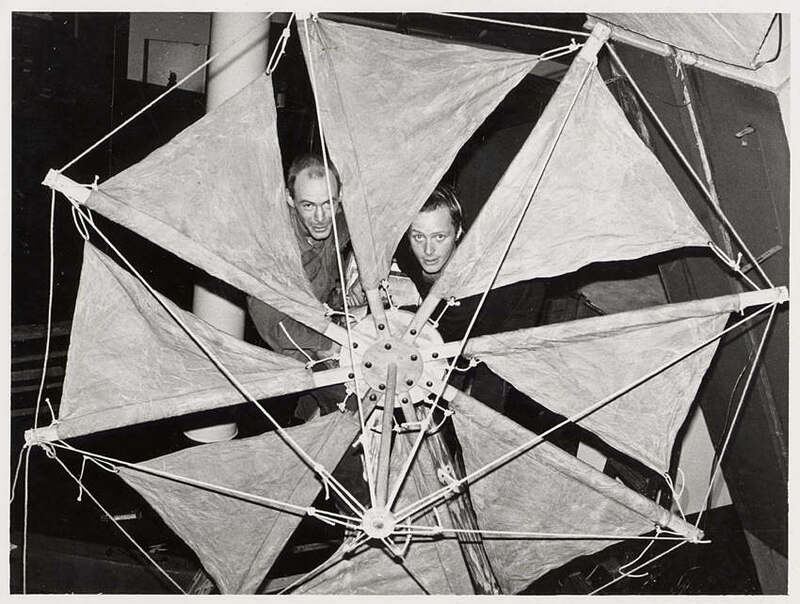 The invention resides in the provision of sails 10 that open and close opposingly in conjunction with a frame structure 12, 14 that supports, controls, shapes and rotates the sails 10 on a vertical shaft, and transmits the energy to the ground through a shaft contained in a mast structure. The sails 10 are fastened to the rim members 12 by two of its diagonal corners. The two remaining diagonal corners are fastened to cables 16. The sails 10 communicate by the provision of the cables 16 and cable guides 18 to position and limit the open and closed phases. FIG. 2 is a top view of the invention in its preferred form showing the relative size of the basic components of the rotor. The operation is dependent on the proportion and arrangement of the rim 12, hub 14, guides 18, and sails 10. The proportion and arrangement of these components remain consistent while the size of the complete rotor assembly can vary according to desired power and local wind conditions. The proportions are as follows: The sails 10 form a square and determine the size of the other components. The hub 14 forms a square with a cable guide 18 at each corner. The measurement of a side of the hub 18 (AD) is one half of a side of the sail 10 (AB). The rim 12 forms a square where the rim elements connect 20. The measurement between these points (EF) is the same as the diagonal measurement of the sail 10 (BC). The extended portion of the rim members (BE) measures one quarter of the diagonal measurement of the sail 10 (BC). Specifications of a typical rotor are as follows: Sails 10 made from Dacron fabric with the dimension 2 m..times.2 m. reside on a frame in which the hub 14 measures 1 m..times.1 m. The rim 12 measures 2.828 m. between the rim connectors 20. The extended portion of the rim measures 0.7 m. The total length of a rim member is 3.52 m. Typically, rim 12 and hub 14 components are made of galvanized tubular steel (with diameters of 2.3 cm. and 1.8 cm. respectively) of the type commonly used for electrical conduit. The two sails (one on each side) are tied closely at the outside trailing edge and attached via lines through pullys at the outside leading edge back past the center post to the matching line on the other sail. In the drawing at left, the right sail (not shown) pulls the left sail into a reach when it is in a run. The lines shown in red would be pulled tight on the left side so that the inner, free, edge of the left sail is pulled tight against the outer leading pole. In the prototype at right, in light wind, you can actually see the rotor accellerate as the reaching sail enters the wind, and this is despite the fact that the running sail has been in a run (using the sailing sense of the word) for some time. None of this is terribly effecient or effective except for this: It will produce usefull work in very low winds due to the large area of the sail and will not be distroyed in high winds because the sails luft so much more as they tack. It is actually a very bad design for high winds and will not produce anywhere near the power that a standard windmill will produce from a good stiff wind. But it will produce a regular, usefull, output over a much larger range of wind speeds and will do useful work at very low speeds where a conventional windmill will not produce any result. It might produce useful work at ground level. It requires a support at the top as well as the bottom and that is a difficult thing to do. As suggested by Bill Roberts, this can be tilted at 45' (the wind doesn't care if its straight) and the lower shaft extended down as a six inch or so plastic pipe with a 1" rubber or clear plastic tube wrapped around it to make an archemedies screw pump for raiseing water. Usefull for pond heating or filters. This variation is released to the public domain and licenced under the GPL but since it is clearly based on a patented item, I would not suggest you try to sell it. The Rhizome Collective built a windmill from a bicycle wheel: "This device is a windmill built from bicycle parts. It differs from most windmills in that it faces only one direction, but this is made up for by its simplicity. It works well in an area with a strong prevailing wind from one direction. It is designed to be able to catch even slight breezes. The weight of the pump rod is eliminated by lightweight nylon strings. 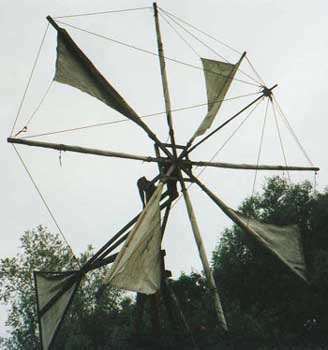 This windmill operates a water pump made from an old bicycle pump. It serves to circulate the water in the pond (not a critical function), but could be used to pump water several feet vertically. In higher wind areas it could conceivably be used to generate electricity. Total construction cost when using easily findable salvage materials is less than $30. " http://www.instructables.com/id/DIY-Wind-Powered-Water-Pump/?ALLSTEPS A water pump wind mill from bicycle parts. This rotor is of a type that is also used on Crete (An island in the Mediterranean Sea), and has a diameter of 6 meter. The windmill has no brake to stop it if storm is coming. The sails must be rolled in. With a certain mechanism, which transfers a rotating movement in a vertical one, the rotor drives a piston pump. This allows the windmill to pump up water from a maximum of 15 meter. With a wind speed of 4 meter per second ( 3 Beaufort) the mill delivers 15 litres per minute if the height difference is 10 meter. If the height difference is less, the mill will deliver more. To build the windmill tools for woodworking are necessary. The gear in the center would be attached to a wind vane and always points in the direction the wind is blowing. In this animation, that is away from us, into the picture. The blades on the right side are turned to catch the air and those on the left are always turned edge on to the wind. There are several variations of Savonius rotor that I have seen, all of which work well. The efficiency of a Savonius is only around 15 per cent but they are ideal for many situations. Some variations are shown below, looking down from the top of the turbine. Good. It is very strong due to the central shaft, but sligtly less efficient than the other two. However, the extra strength allows the rotor to be supported at one end only. This design is also very simple, and can also be made easily from metal drums or pipe sections. The design is slightly more efficient than the one above as some of the air is deflected by the second vane as it exits the first one. This is the most efficient Savonius design. It not only has the advantage of air being deflected twice like the design above, but also that the vanes act partly like an airfoil when they are edge-on into the wind, creating a small lift effect and thus enhancing efficiency. This design is much more difficult to build, requiring vanes rolled from metal sheet instead of being cut from drums or pipes. http://patft.uspto.gov/netacgi/nph-Parser?TERM1=6,523,781§1=PTO1§2=HITOFF&d=PALL&p=1&u=/netahtml/srchnum.htm&r=0&f=S&l=50 Axial-mode linear wind-turbine. Flys a kite back and forth and uses its pull against the line to generate power. Actually very interesting. One of the biggest benifits is that the part that needs to be high in the air is just fabric and lines so no damage will be done if it comes down. http://www.suburbia.com.au/~ata/articles/70byosav.htm A Savonius roter on a motor on a pole charges a battery to open a remote electric gate. http://www.turby.nl/ A vertical axis variation on the H blade Darrieus. http://www.ropatec.com A vertical axis combination of the savonious and darrieus rotors. Another crazy idea for a high speed but very safe and light, high flying windmill. One of the more interesting tradeoffs in windmill design is between the area swept by the blades (or other surface) and the speed of the shaft. Conventional windmills use very large blades sweeping a huge area from a central hub. But as the blade gets longer, that hub turns slower. To generate electricity, or really any useful work, you need a shaft spinning quickly. So at the top of those huge windmills, there is a huge, and very strong, gearbox between the input shaft and the generator. That gearbox is very expesive, heavy, contains many moving parts, and requires regular maintenance to avoid failure. Having a slight deviation between the plane of each rotor and the wind direction has almost no effect on performance. Note that no "tail" or other means of orienting the array is necessary if we place the center of aerodynamic drag of the entire driveshaft with its attached rotors slightly downwind of an azimuthal pivot point; the machine will faithfully stay headed windward. Protection in high winds can be provided if a flexable shaft, such as carbon fiber, is used. 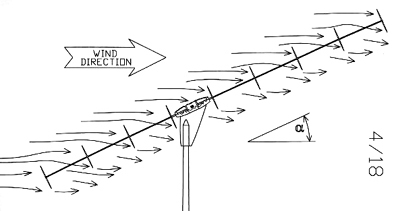 Several factors act to protect the machine in high winds: First, at the higher reynolds numbers that come with increasing wind speeds, the length of wind shadows effectively increases, so that upwind rotors will begin to protect downwind rotors. More importantly, the downwind section of the shaft will tend to bend to a more horizontal direction, placing downwind rotors more into the wind shadows of the upwind ones. Finally, the generator and shaft can be resiliently mounted, so that they are blown into a more horizontal orientation by very strong winds, so that overall rotor exposure is reduced, while power output and rpm are maintained. They key to proper behavior at all wind speeds is that progressively more rotor surface is exposed in low winds, and less in high winds. No furling cycle is involved, so there is never a time when no power is generated because of excessively strong winds. The action is also not as radical as furling, and is less prone to "finicky" behavior.